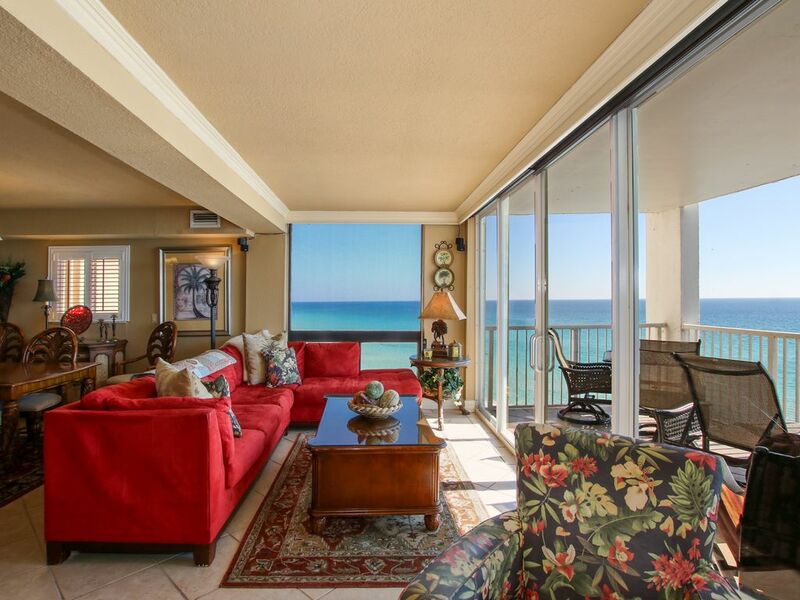 Our unit at Shoreline Towers is an oversized 1700 square foot condo right on the Gulf. Forty feet of wrap around floor to ceiling windows gives you a breathtaking view of the most beautiful beaches in the world. With a 180 degree view from the 7th floor you can see a Sunset and a Sunrise right from the balcony. During the day see the dolphins play and the fishing boats run by while your watching from your large living room. Located on prized Gulf Shore Drive in the Heart of Destin, just a short drive to a luxury outlet mall or Gulfarium, some of the finest golf courses in the south and definitely the 'Worlds Luckiest Fishing Village' with water parks and miniature golf to make this area fun for everyone and within walking distance to many fine restaurants, shopping and grocery stores. There are 2 master suites each featuring a king-size bed and a connecting bathroom. The Master bath has a large glassed in shower with double showerheads and a built in seat, the 2nd master bath has a deep 'Soaker Tub'. The 3rd bedroom has a queen bed . A roll away bed is available for use also. 60' LCD 1080P in Living room, 40' LCD in Master and 32" in Back master bedroom, 32' LCD flat screen in Kitchen,a 26" LCD in 3rd bedroom, DVD, Desktop Computer with Hi-Speed internet and WIFI and a cabinet full of games and puzzles are for those days when you've had too much sun. The seventh floor view and the sound of the ocean is unforgettable. Take the elevator to the bottom and step out on the whitest beaches and into the bluest of waters and one of the few beaches where you can enjoy both a sunrise and a sunset over the water. The Best view of the Gulf in Destin. The building is the closest to the beach in Destin. New buildings must be built further back from the water. Central air with 2 separate units 1 for bedrooms and one living area. A dream kitchen with a full view of the gulf as you cook. 60" LED 1080P in living room, 32" LED in Master Bedroom, 32" LED TV in Back bedroom ad 21" in Queen Bed Guest Room. The Dolphins swim by most mornings. And playful rays surf the waves. A Sunset can be seen from here every night and in Sprintime you can also see a sunrise also from the balcony. I did a lot of research before choosing a rental and we are SO glad we went with this one, I wish we could give more than five stars. From the beginning, the owners were very accommodating (which was awesome, as we were traveling with a 10 month old). The condo is beautiful, the view unbeatable, and the location is right in the middle of everything. The kitchen was also completely stocked with everything we needed! Five of us and a baby stayed comfortably in this condo. I can definitely see why this rental books out so far out in advance and we plan to stay here again! The accommodations were well beyond our expectations. The condo had everything we needed. The view is spectacular and provides a panoramic vantage point over the beach and ocean. The weather was clear and sunny the entire week which just added to a perfect vacation. The owner is fabulous. Had some issues with washer and dryer but that could happen anywhere. Thankful for the owners allowing my family to share their home. Very nice place well kept as I would keep my home. Condo in good location to restaurants and grocery. Pool was a very nice size but had to walk a distance from condo. Would definitely stay there again. Beautiful sunrise and sunset can be seen from condo. I loved the condo. The location to the beach was amazing. It's was unfortunate that the beach area had so many umbrellas that you either had to pay to rent one or sit behind them. While the condo and location are terrific, the umbrellas on the beach will be a significant deterrent on whether I return or not. I am pleased that you found our condo and beach location "amazing". As far as the excess of umbrellas that business is contracted to an independent operator. Usually the front desk can make sure there is adequate space in front of the umbrellas for guests.